Rogue Legacy mixes up genres and, through some inspired design choices, brings out the best in both. A deep and challenging game designed for small sessions and maximum satisfaction. 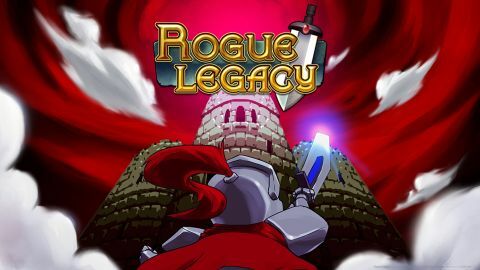 Rogue Legacy is a blend of influences that could have gone wrong. On one side is the Metroidvania genre, 2D platformers with large explorable environments and a steady sense of progression. On the other is the rogue genre, punishing randomly-generated worlds where each death means a complete fresh start. Rogue Legacy doesn't just make these contradictions work – it excels at knitting them together. The game is set in a castle of ever-moving parts that changes for each playthrough, and you control a heroic adventurer who explores as far as possible before dying. The sword combat is simple, with your character having only a forward swing and downward poke, but it is also precise and constructed around how enemies move – neon skulls, flame-hooved horses, corrupted knights, blood-spitting eyeballs, and other vicious phantasmagoria can't wait to swarm any careless player. Rogue Legacy's enemies are not the kind of thing that, individually, give you much trouble. But every room has multiple varieties in randomised layouts and, if you're being targeted by three different types of ability at once, getting close enough to attack is more difficult than landing the hit. This is helped by a range of randomised spells which can take out enemies at a distance and from various angles, but a tight pool of mana (initially at least) makes this a rare extravagance rather than a crutch. No matter how good you are, the adventurer will eventually fall. But death is not the end in Rogue Legacy; it's a new generation. Your current hero's progress is totted up and their gold plus any special runes or blueprints they've found are passed on to the next in line. You've a choice of three heirs with which to start over, in a newly-randomised castle, and before entering have to spend all the money or lose it – meaning you can't just save up for expensive upgrades, but must earn them. Another great touch is that each of your children will be different classes – everything from Mages that siphon mana from enemies to fast-moving Shinobi and doughty Barbarians. On top of this they have different attributes – Dwarfism makes your sprite small, which is a positive boon, while some characters swear copiously upon taking a hit or can only see the castle through the sepia-tinted lens of nostalgia. The idea of controlling heirs could have been cosmetic but here is crucial – a new generation featuring a damage-dealing Hokage with dwarfism and no sensation in his or her feet (so spikes don't hurt) is the dream ticket. They also lead to changes in pace across runs: the Spelunker isn't much of a fighter but can gather more treasure, so you're focused on grabbing the dough and avoiding combat as much as possible. This is how Rogue Legacy so brilliantly blends two disparate genres. Roguelikes depend on the player mastering their systems, and being resourceful in bad situations. But by introducing elements of persistence these core principles are kept, while also allowing lots of otherwise unsuccesssful runs to have some tangible value. It's basically a family heirloom system, so all the gold and new equipment and upgrades are passed on to the children. The core game keeps changing, but your big and little achievements stay permanent. Rogue Legacy makes this work so well by scaling in difficulty to adapt to your increasingly buff adventurers, who 'level up' as you improve abilities with gold. The incremental stat boosts, fancy gear, and ability-granting runes (allowing a double-jump, for example, or vampirism) are amazing, but soon the room layouts become larger and more challenging alongside more and tougher enemies. So as you improve your chances, the game not only sustains the challenge but in some ways increases it. One last touch ties everything together. Fairly early on an architect turns up outside the castle entrance, and in return for 40% of your winnings will let you keep the previous layout of the castle – rather than having it randomised. The financial sacrifice means you don't do this lightly, but it's an incredible relief when you finally ferret out a boss or a challange chest and are able to have multiple attempts in return for a piece of the reward. By offering what is basically a retry button, Rogue Legacy takes another risk – after all, if a roguelike can't kick you in the teeth then what can? It works because, even though you can practice, it allows the designers to make each boss especially fiendish and deserving of multiple failed attempts before glorious victory. Without this compensation the architect might have taken the fun out of things, but here he's the final flourish on a structure of awesome complexity. Rogue Legacy is a gentle entry point into some of gaming's most forbidding mechanics. It is perhaps easier to complete than your average roguelike, which is no bad thing, because the persistent structure means it's also kinder. The average run is shorter than a Spelunky run, but again the persistent structure means it can count. This all adds up to an uncommonly fantastic structure for any game. Rogue Legacy seems unassuming, but it breaks the rules of its inspirations in order to bring them together in a way that works. It has challenge and variety, but it's also forgiving of mistakes and allows the toughest challenges to be repeated. Rogue Legacy's castle seems so crackable, and yet puts up such resistance. Which is why it soon becomes an obsession. Rogue Legacy is a different game every time. And all of them are great. Description Adventure, battle, explore, then when your time is up, pass the tradition on to your children.